I began making books in 2001, and found at once that this was a good medium for me. The book form allows me to explore many themes, ranging from the personal and social to the ecological, from dream and myth to journeys through the landscape. I love combining the magic of words with the immediacy and tangibility of pictures, in the unfolding series of pages, which is the nature of books. 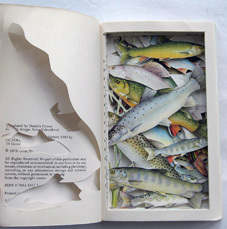 Artists’ books are works of art that utilize the form of the book. 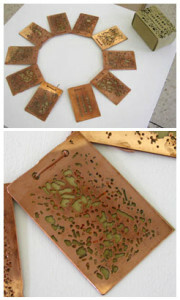 They may be a book that can be opened, read or viewed, or be a book-like sculptural object. The intention is often to slow the speed of reading, and make people pay attention to the full experience, including seeing, feeling, exploring. 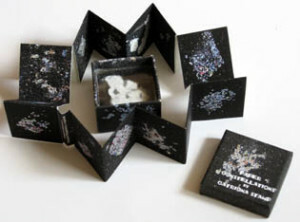 Artists’ books include a wide range of forms, including scrolls, fold-outs, concertinas or loose items contained in a box. 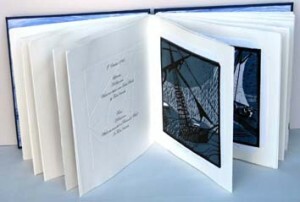 The concertina form is especially useful for display books in an exhibition setting. My books include small editions, and one-off books and objects. The editions tend to be printed digitally to make them more affordable. 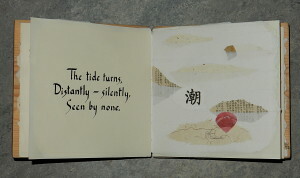 One-off books or very small editions usually employ more original print such as lino-cuts for the illustrations, and may use calligraphy for the text. I have books in the Tate, UCA, Farnham and Manchester Metropolitan University Artists Books Collections.